Located in Shiga Prefecture, Toyosato Elementary was a public school until 2001 and is renowned for its architecture, philosophy in accepting students regardless of their financial situations, and its director who donated everything he could to the school. 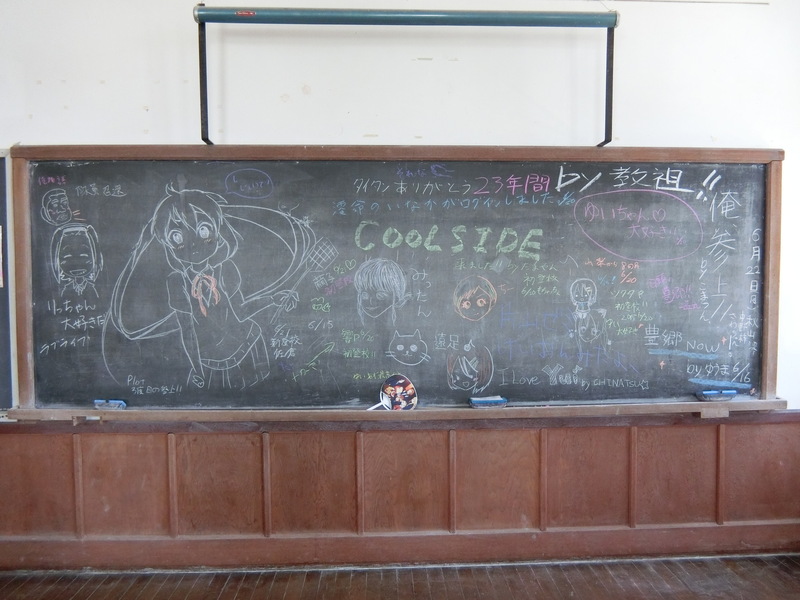 Moreover, the school has gained more recognition primarily as being the location in 2011 for the K-ON! movie as well as the Haganai (i.e. 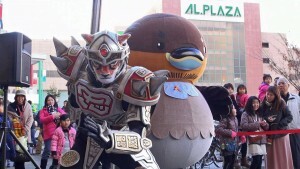 I don’t have many friends) live action movie among others. 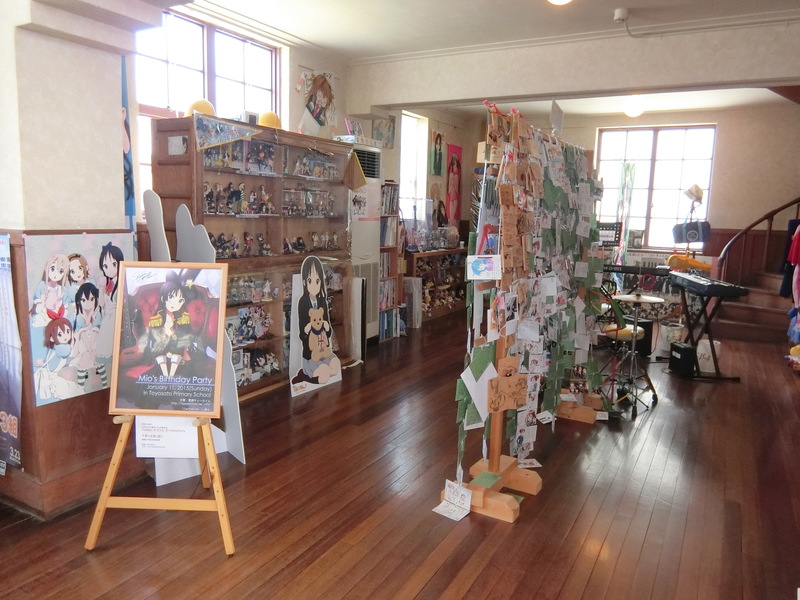 In fact, while those obsess over anime and/or manga are given a bad rap as otaku, Toyosato Elementary openly encourages everyone to visit and has numerous props on display (some even fan-made)! 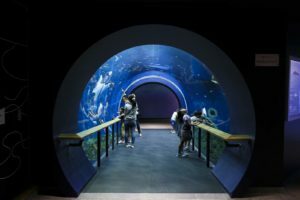 Not only do I believe that you can only experience some things for yourself in person, but even if you aren’t really interested in those movies, this place might spark your interest. Hopefully, this article based on last week’s tour will be enough to satisfy you until you check it out yourself. 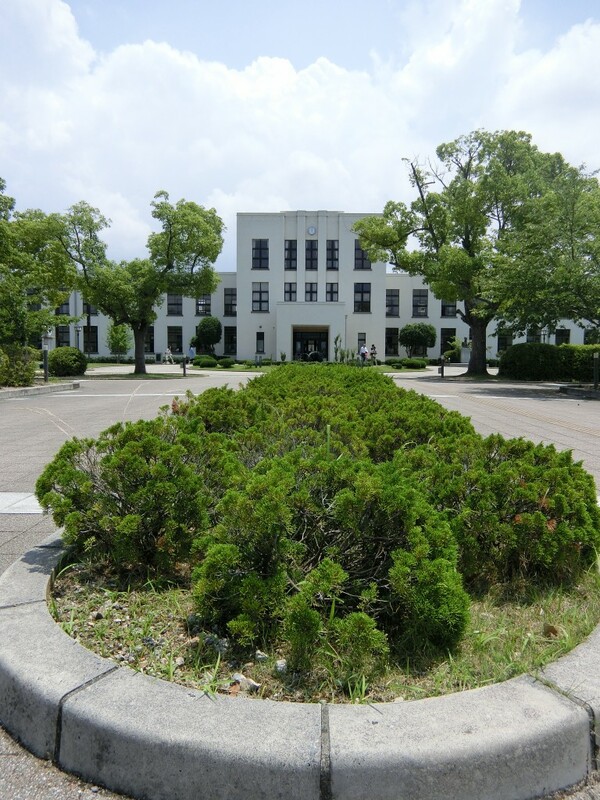 Covering the same area as the Tokyo Dome, Toyosato Elementary was established by Tetsujirō Furukawa and started in 1937 as an elementary school. Before the school existed, he had worked abroad throughout the United States and Europe which intensified his desire to strengthen Japan. According to him, the best way was through education. 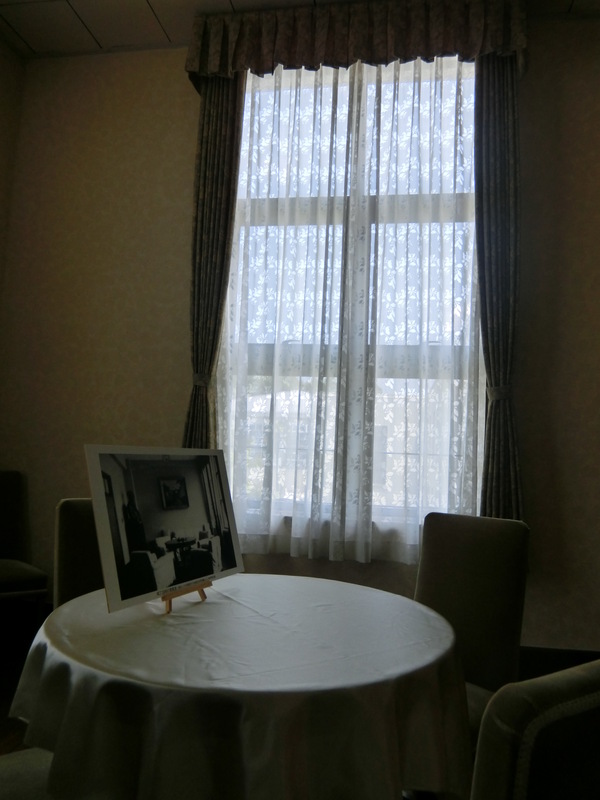 To this end, he donated today’s equivalent of 2 billion yen (20 million USD), furniture, the dorms, etc. to the school despite having financial issues later on. Furthermore, the school was open to all students, particularly those without money which stands as a testament to his character. 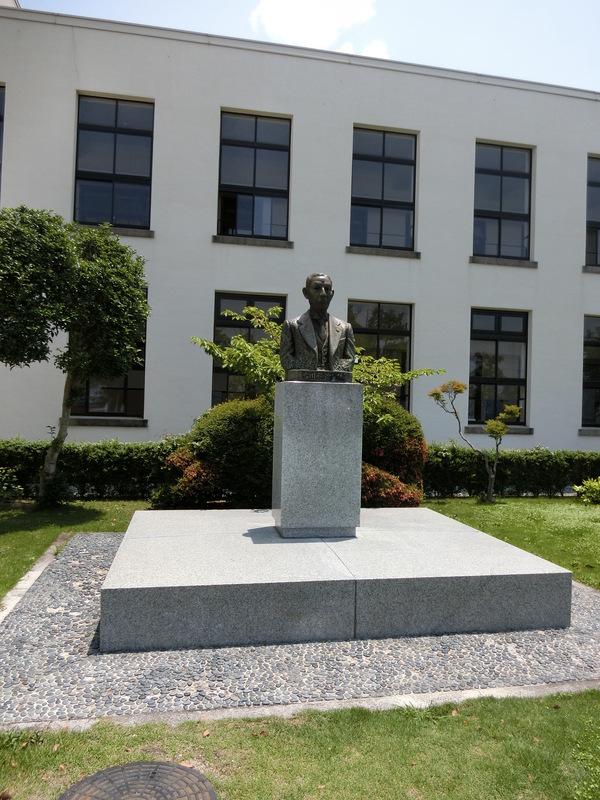 Another man that exhibited influence over the school was its architect, William Vories.Vories originally came from Kansas as a missionary to Shiga Prefecture and later became famous for his work in architecture throughout Japan. 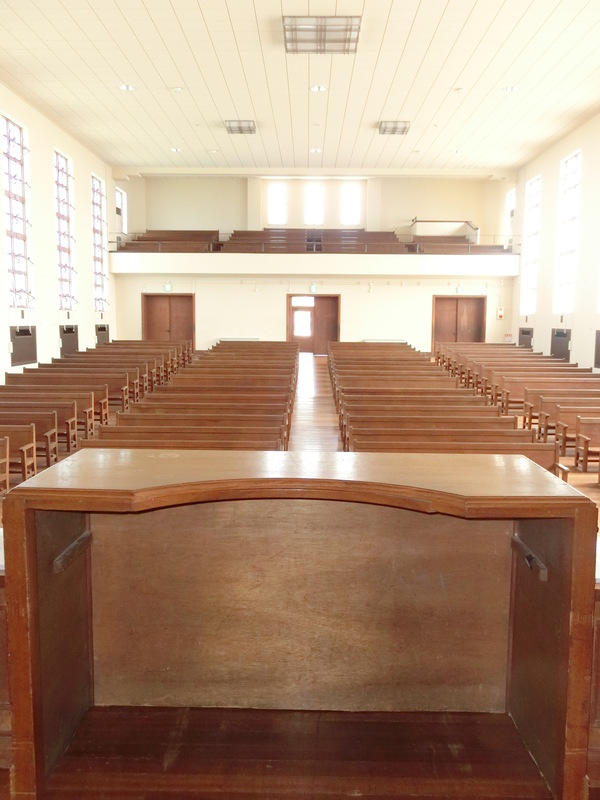 His influence can be easily be seen in the church like seating in the auditorium. Then, less easily seen are his practical designs of the classroom windows, floors, and stairs for the children. 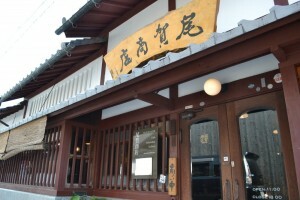 Additionally, the window ledges which may appear to be styled in a Western fashion actually use a Japanese technique known as Jintogi which is no longer widespread. 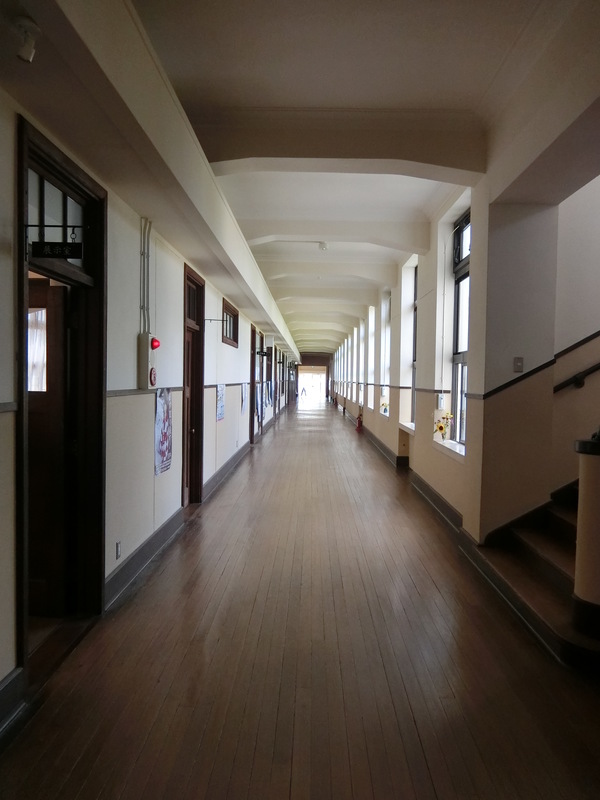 Other additional noteworthy features of the school was that it had a pool (uncommon in Japanese schools until the 60’s), flush toilets, a place to heat bentou boxes, and centralized heating which is uncommon even in modern schools. In particular, another feature that has its own special story in the school are the staircases. 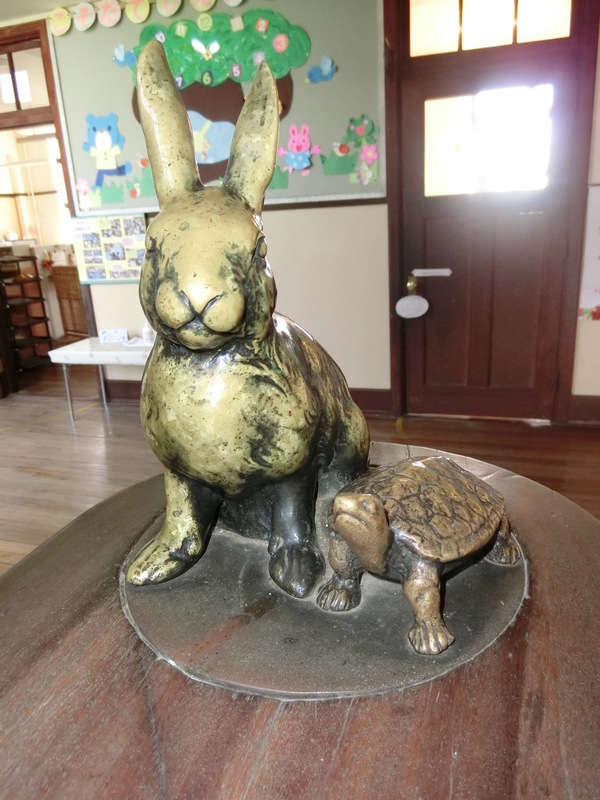 On top of the staircases are metal figurines of hares and tortoises. When Tetsujirō was a child, he was not good at studying. 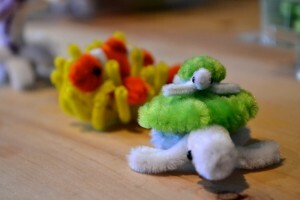 So, one day his teacher told him the fable of the tortoise and the hare. His teacher compared him to the tortoise, and assured him that if he tried hard he would be ok. 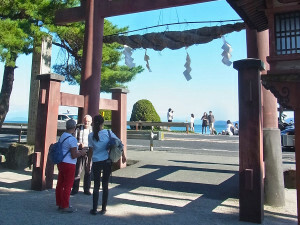 Yet, it was Vories who decided to add them to the staircases and not Tetsujirō himself as a way to honor him. 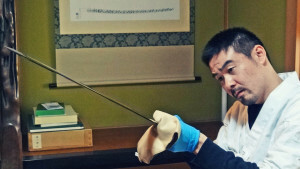 Unfortunately, despite this kind gesture, some of the figurines were removed due to metal being scarce during the war. 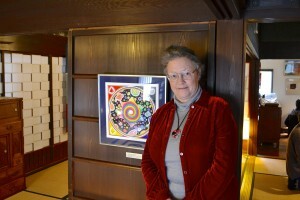 It is thanks to a director noticing that they were missing that they have been restored. 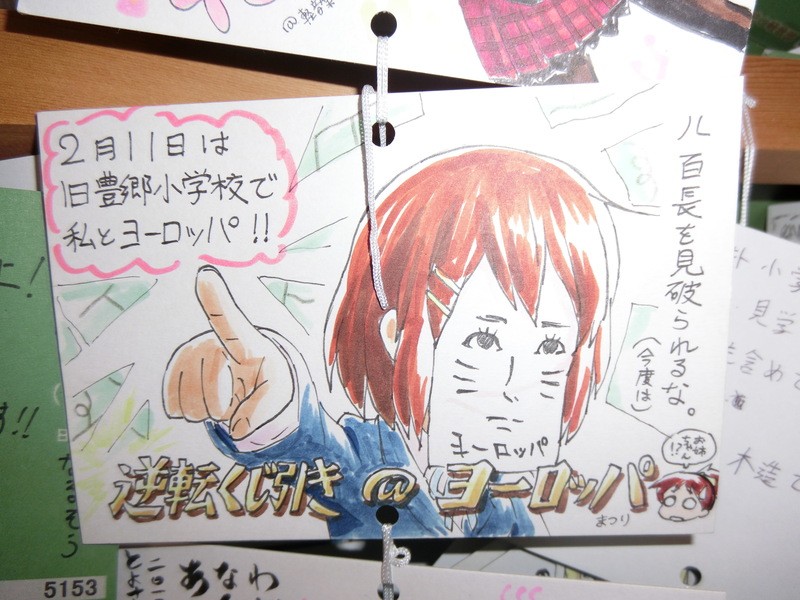 Now, in relations to the movies, the most famous one based here is けいおん, otherwise known as K-ON!, which is a manga turned anime based on the life of high school girls who form a light music club. *edit: Removed a youtube clip of the anime’s opening sequence which was removed by the copyright holder, TBS. But you can catch a glimpse of it on the TBS site with the trailer of the feature film version. 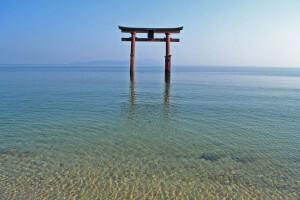 One can easily see the resemblance between the actual structure and the anime by seeing that alone. Yet, some things that only appear in the manga or the movie can be seen in the school as well, but finding these things out is part of the enjoyment so I won’t spoil it too much. 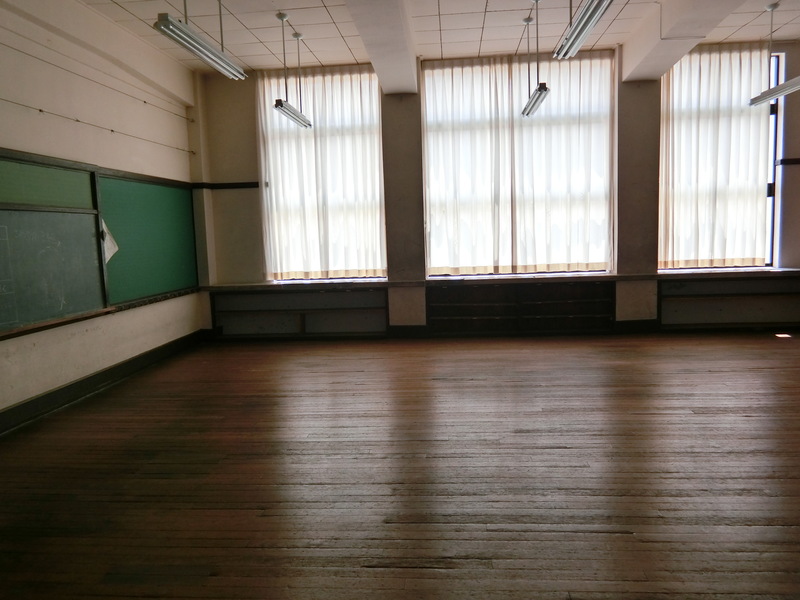 That being said, there are three rooms that stand out throughout the school: the auditorium, the music room, and the Tea Time room. Of course if you perform, you’re going to need a place to do so. 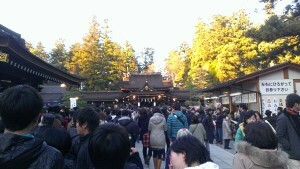 It is here where they performed during the movie and where they still continue to perform every November. 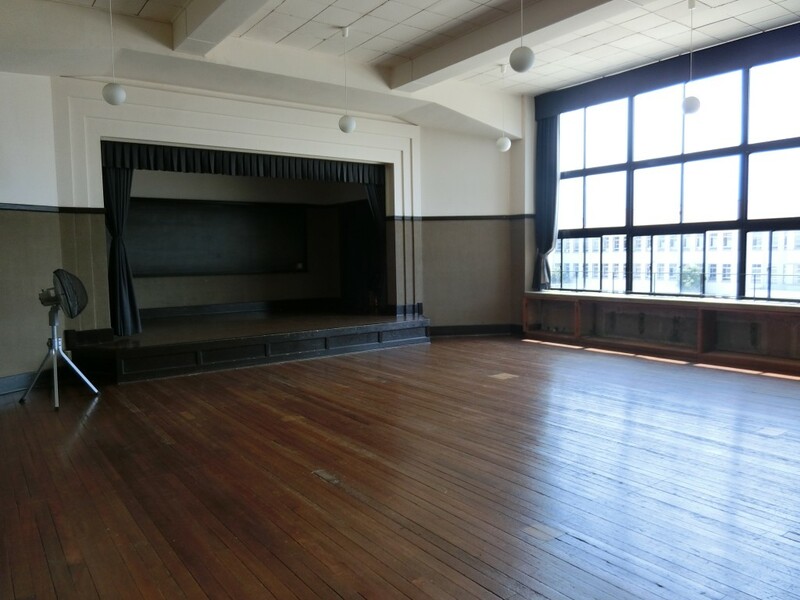 During other times, the auditorium is available for rent (4,000 yen/day) along with the piano. This includes being able to use the space for graduations, so like the girl’s having a graduation trip to London, one could have a trip here. 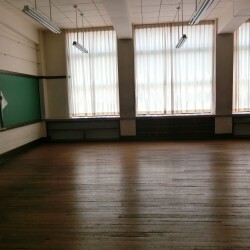 Moving on, there’s the music room. 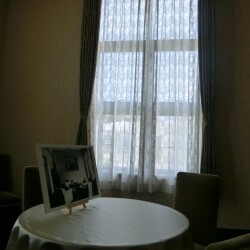 Located on the third floor, it is the only room. This is because it is not soundproof, but to solve this problem, they made it so that the classrooms on the second floor wouldn’t hear anything by putting it here. 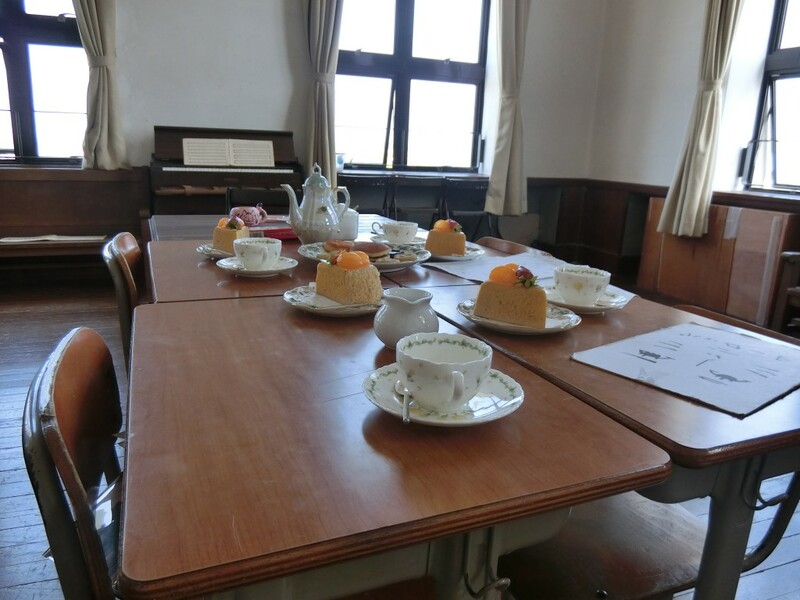 After all, could you picture the girl’s practicing in the Ho-kago Tea Time room every day? 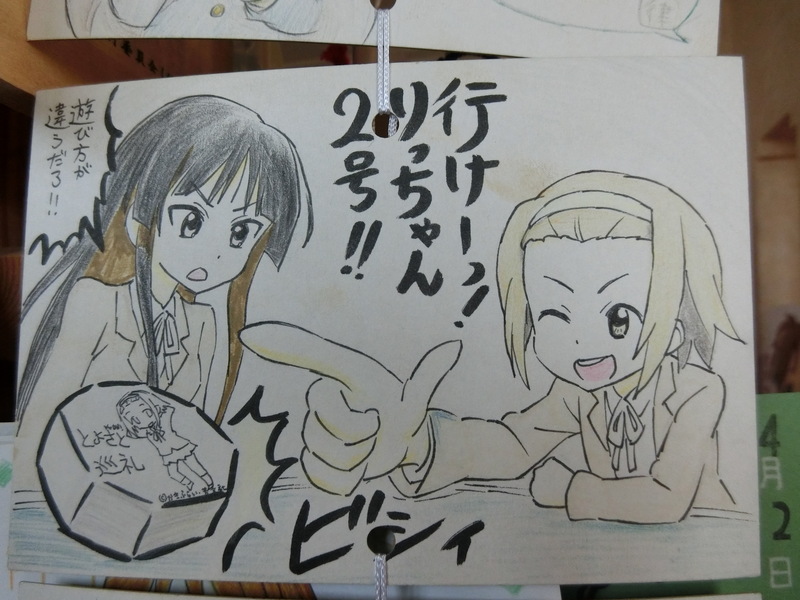 Not only would they get in trouble, but Mio certainly wouldn’t have the confidence to have the whole school hear her everyday. 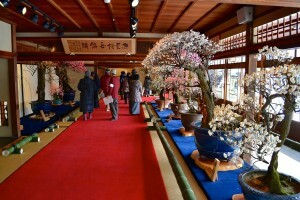 Speaking about the Ho-kago Tea Time room, it certainly is something. Not only is there a set from modeled from the movie there, but fan’s have contributed to it by making shoes for the characters and another desk. 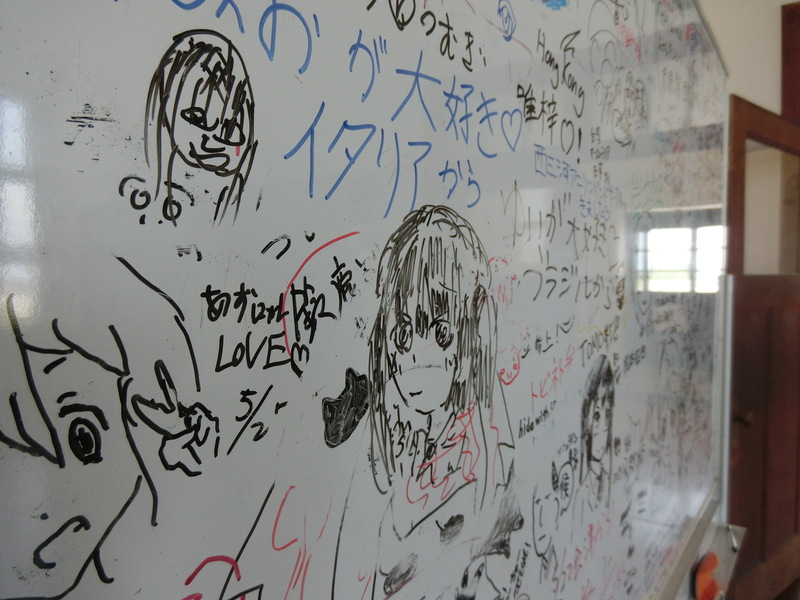 I was further surprised by the blackboard and whiteboard being filled with drawings from fans from across the world. 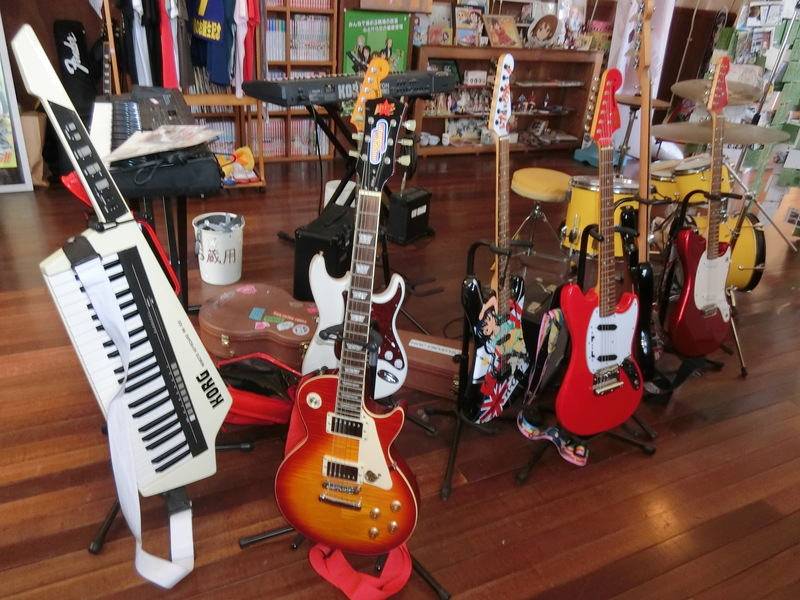 We were told that people from over 18 countries such as Brazil and Italy have come as fans of K-ON! and left messages. 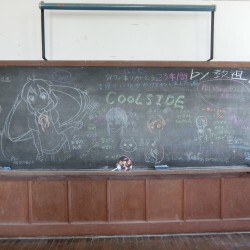 Also, instead of just erasing the blackboard, photos are taken and complied into a giant book. 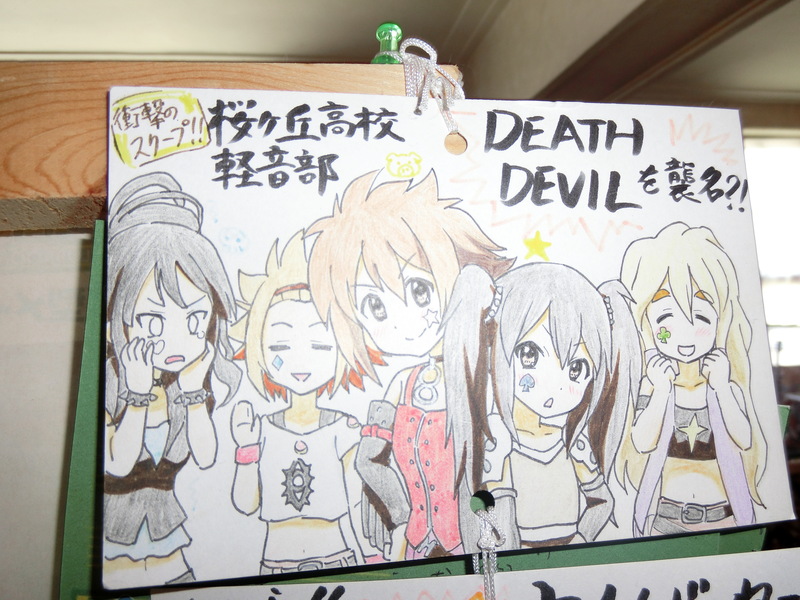 That goes to show how popular K-ON! is, and everyone’s dedication is refreshing. Yet, there’s more! 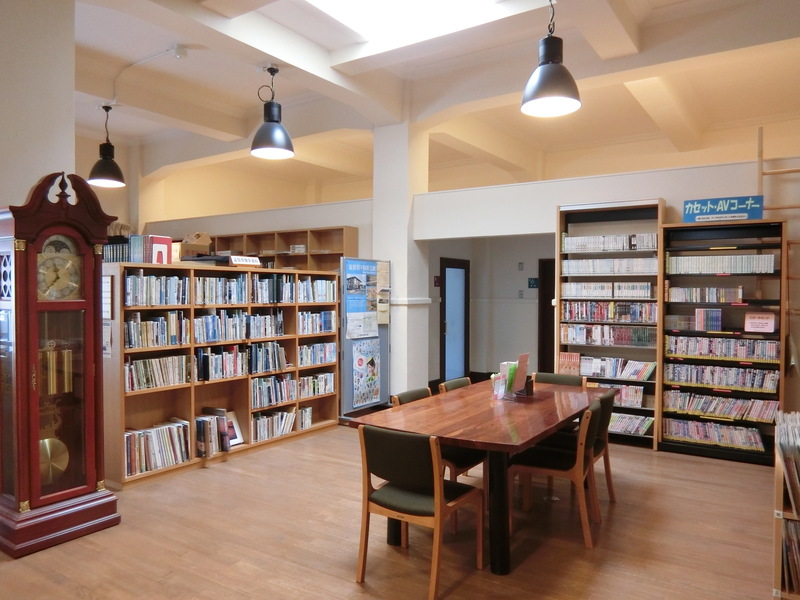 A part of the old library has been converted into an information center as well as a spot dedicated to K-ON! 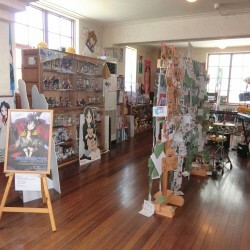 That is, the instruments from the movie, fan’s artwork, and various character goods are displayed. It makes me a little jealous of other’s drawing skills, but this pleasantly surprised me again. 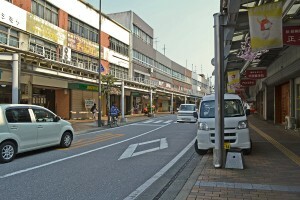 Until you can catch a train (Ohmi Line) to Toyosato, hopefully you can enjoy the pictures from our trip. Whether you enjoy history or anime, Toyosato Elementary is a significant place. 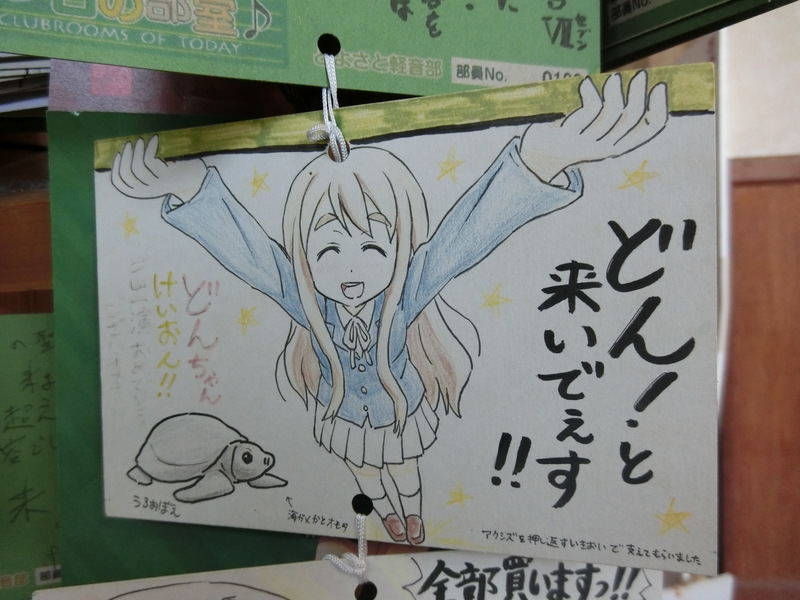 That being said, the first photos are of the school and the second are those focused on K-ON! 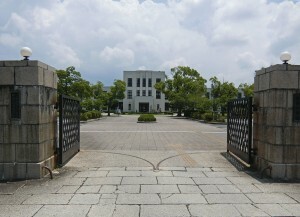 Toyosato Elementary. Overlooking the grounds. 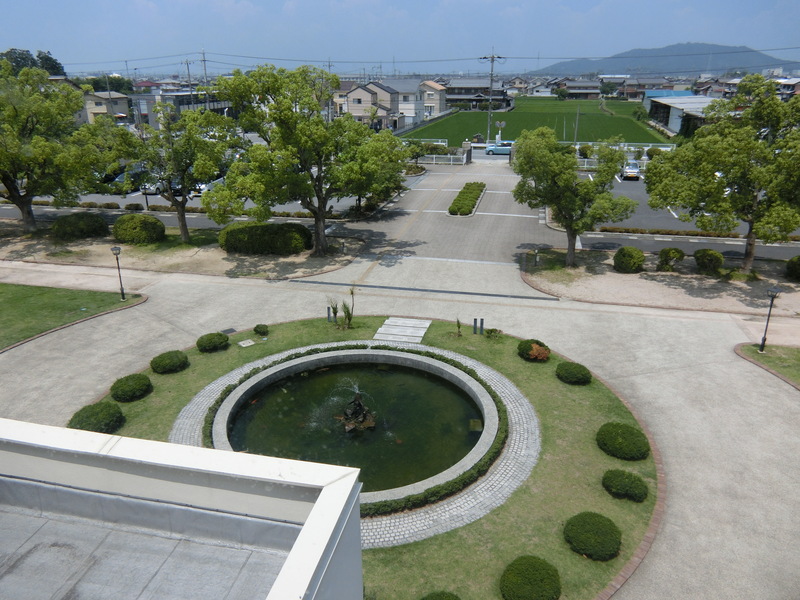 Toyosato Elementary. 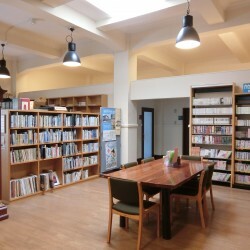 Community Center and Library. 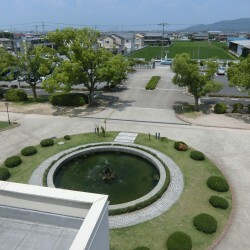 School Grounds. 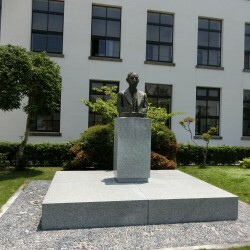 Bust of Tetsujirō Furukawa. 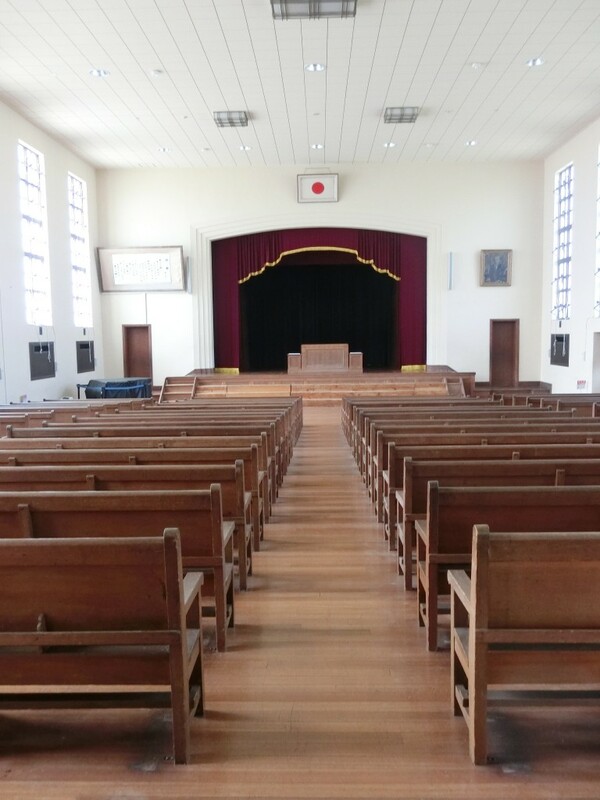 Auditorium. View from the stage. 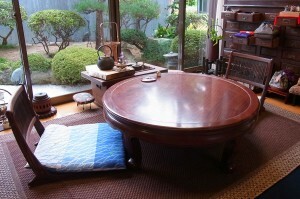 Ho-kago Tea Time Room. Blackboard. Ho-kago Tea Time Room. 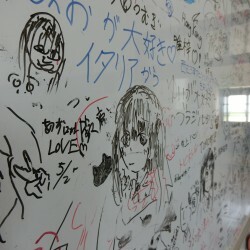 White board. 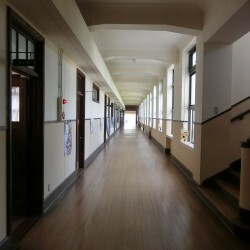 Située dans la préfecture de Shiga, L’école primaire Toyosato était ancienne école publique renommée pour son architecture, pour sa philosophie d’accepter tous étudiants sans regarder à la dépense et son directeur qui a fait des dons malgré ses problèmes financiers soi-même. 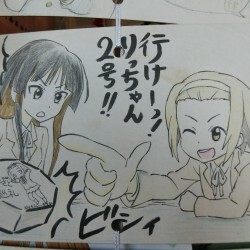 De plus, l’école primaire est devenu reconnu principalement comme le lieu du film K-ON! en 2011 et du film Boku wa tomodachi ga sukunai (Je n’ai pas beaucoup d’amis) parmi des autres. 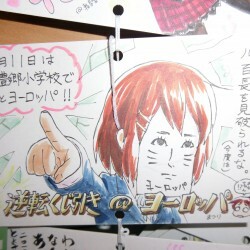 En fait, ceux qui obsèdent par l’anime ou le manga, on s’appelle «otaku», mais cela porte souvent un sens négatif, mais cette école encourage tout le monde à visiter. Il y a même beaucoup d’accessoires qui sont faits par partisans. Couvrir autant de terre que le Tokyo Dome, l’école primaire Toyosato à été établie par Tetsujirō Furukawa et il l’a commencé en 1937 comme une école primaire. 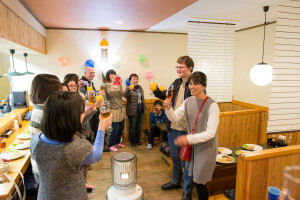 Avant cela, il travaillait aux États-Unis et à l’Europe et cette expérience a renforcé son désir de fortifier le Japon. Selon lui, la meilleure façon est par l’éducation. À cette fin, il a fait de deux milliard yen, meubles, dortoirs et cetera à l’école malgré ses problèmes financiers plus tard. En outre, le fait que l’école était ouverte à tous surtout ceux qui n’avaient pas d’argent, il est un testament à son caractère. Un autre homme qui avait d’influence sur l’école, il était son architecte William Vories. 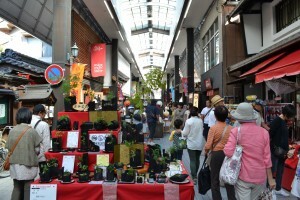 Originalement, Monsieur Vories est venu de l’état du Kansas à la préfecture de Shiga comme un missionnaire. 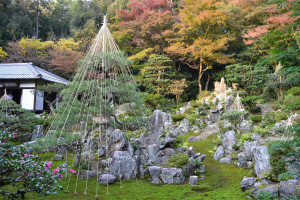 Plus tard, il est devenu renommé pour son architecture à travers du Japon. 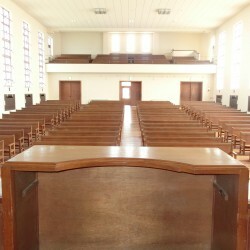 C’est à la salle de spectacle où on peut facilement voir son influence sur les banquettes qui ressemblent ceux d’une église. Ensuite, il y a les fenêtres, escaliers et planchers qui sont faits pratiques. Les rebords de fenêtres ressemblent aux fenêtres occidentales, en vérité, on les a faits avec une technique qu’on s’appelle Jintogi. Malheureusement, c’est rarement pratique ces jours. 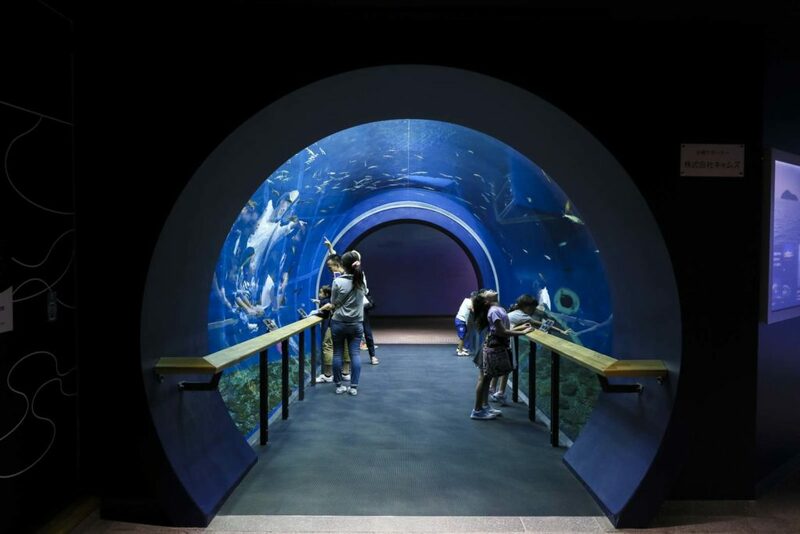 Des autres points notables de l’école sont sa piscine (qui étaient rarement dans les écoles japonaises jusqu’aux années soixante), les toilettes qui pourraient tirer la chasse, un lieu pour se réchauffer les bentō des étudiants et le chauffage centralisé (qui n’existe même pas aux écoles modernes). Particulier, une autre caractéristique qui a son histoire spéciale est les escaliers. Sur les escaliers sont des figurines en métal de lièvres et de tortues. Pendant son enfance Tetsujirō n’était pas doué pour étudier. Donc, un jour, son prof lui a parlé de la fable du lièvre et de la tortue. Il lui a comparé à la tortue et il lui a dit que s’il essayait, il réussirait. En revanche, c’est Vories qui a décidé d’ajouter les figurines de façon que Tetsujirō soit honneur. Malheureusement, malgré ce bon geste, il y avait un manque de métal pendant la Deuxième Guerre mondiale alors on a enlevé des figurines. Elles sont rendues à grâce à un directeur qui a fait attention à leurs disparitions. Maintenant, en rapport avec les films le plus renommé est けいおん, c’est-à-dire K-ON! 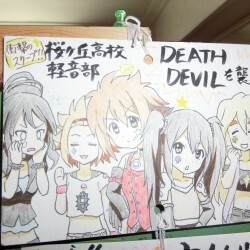 C’est un manga qui est devenu un anime et il concerne la vie des lycéennes qui créent un club de musique. Dessous est l’opening de la première saison. On peut facilement voir la ressemblance entre l’école et l’anime non? Il y a des choses qui apparaissent seulement dans le manga ou le film, mais je vous les laisse trouver pour votre plaisir. 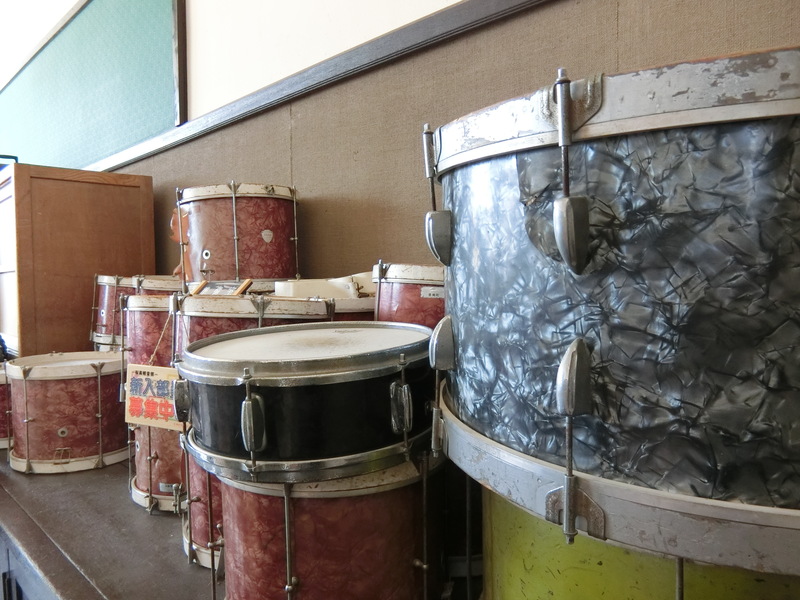 Cela dit, il y a trois salles particulières dans l’école: la salle de spectacle, la salle de musique et la salle Ho-kago. Bien sûr si l’on joue sur scène, on a besoin d’une scène. Ici, les filles ont joué pour le film et elles continuent à jouer chaque novembre. Quand il n’y a pas de spectacle, on peut louer la salle de spectacle (4,000 yen/jour) avec le piano. Cela comprend la capacité à utiliser la salle pour la remise des diplômes, donc comme les filles sont allées à Londres, on peut venir ici. 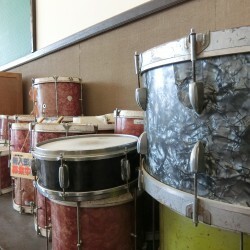 Puis, il y a la salle de musique. Située au deuxième étage, elle est la seule salle. La salle n’est pas insonorisée, donc elle est située au deuxième étage ainsi qu’on ne peut entendre rien dans les autres salles de classe. 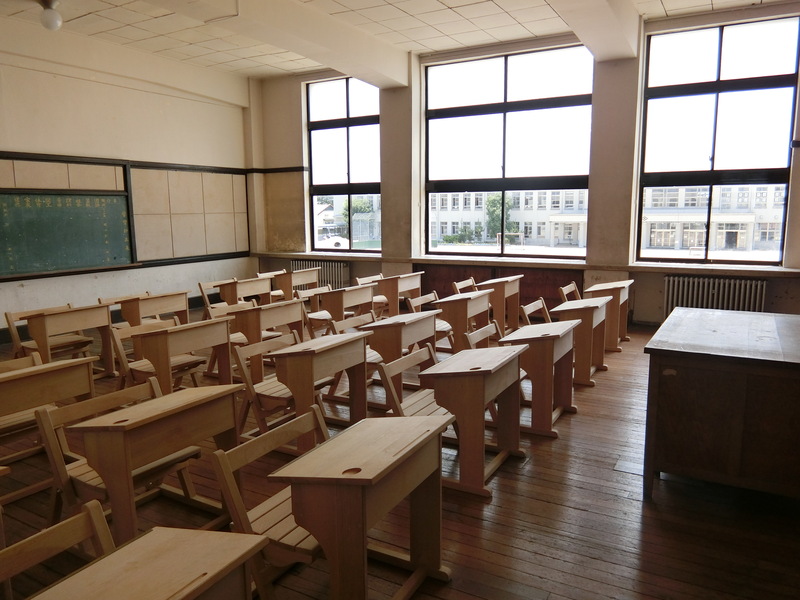 Après tout, pouvez-vous voir les filles s’exercer à la salle Ho-kago chaque jour? Elles avaient des ennuis et surement, Mio n’avait pas de confiance où toute l’école peut l’entendre. Parlant de la chambre Ho-kago, c’est certainement quelque chose. Il y a le plateau du film ici, mais les partisans ont donné des chassures des personnages et un pupitre aussi. En outre à mon étonnement, le tableau noir et le tableau blanc sont pleins de dessins des partisans à travers le monde. 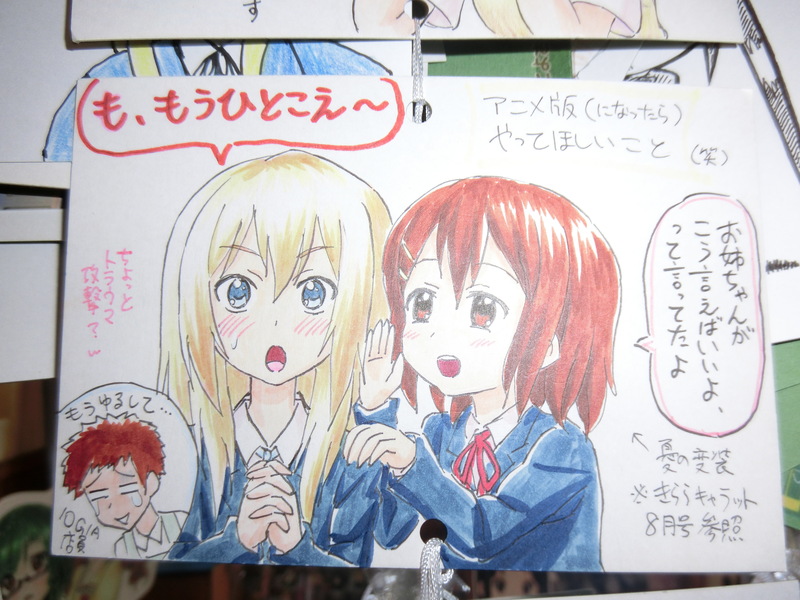 On nous a dit que des personnes de plus de dix-huit pays comme l’Italie et le Brésil, qui sont des partisans de K-ON!, elles allaient et laissaient des messages. Puis, au lieu d’écraser les messages sans trace, on prend des photos des dessins et on les met dans un grand livre. 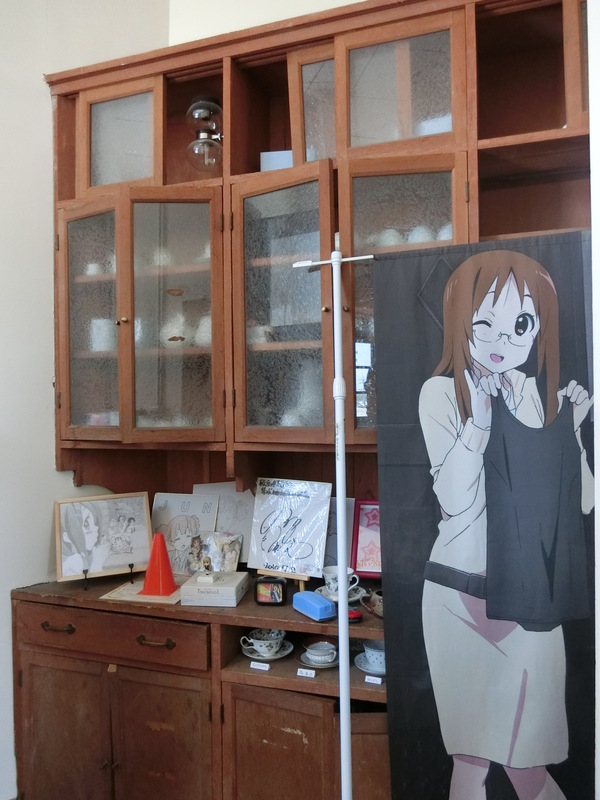 Cela on fait voir la popularité de K-ON! et le dévouement de tout le monde est rafraîchissant non? Mais, il y a plus! 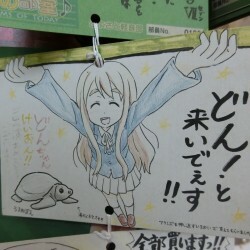 Une partie de la vieille bibliothèque est convertie dans un centre d’information et il est devenu un lieu dédié à K-ON! Là, il y a des instruments du film, des dessins des partisans et des produits des personnages. Cela me rend un peu jalouse d’autres, mais en même temps c’est un bon surpris. 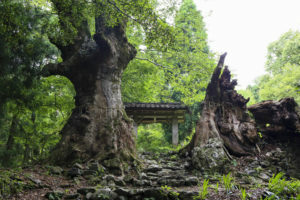 Avant qu’on ne puisse aller en train (Ligne Ohmi) à Toyosato, j’espère que vous aimez ces photos de notre voyage. Les premières photos sont de l’école et les deuxièmes photos sont relatives à K-ON!